Telehealth is rapidly proving its worth as way of broadening access to healthcare. Now, an innovative coalition of medical providers, technology companies and the National Federation of State High School Associations (NFHS) is using telemedicine to test a new way of caring for Mississippi football players who experience concussive injuries. The University of Mississippi Medical Center (UMMC) will lead the study, using technology from Dell and VSee to determine the usefulness of providing on-the-spot concussion evaluations for high school football players who are injured on the playing field. The study looks at the use of video conferencing to provide concussion evaluation by physicians for football players at 11 high schools in rural locations across Mississippi during the 2015 football season. The pilot is scheduled to begin on August 28, 2015, and the technology will be available to the selected schools through the duration of their seasons. In partnership with VSee, Dell will offer a low cost, HIPAA-compliant, video telemedicine platform for VSee software, which can connect remote physicians with patients anywhere in the world via the Internet. In this study, the system will connect a remote physician with an athlete on the field for the concussion consult. Dell will provide Windows 8 tablets with built-in high-definition cameras, to facilitate the video consult. At the end of the football season, UMMC’s Center for Telehealth will provide metrics to the NFHS to show how often the system was used and to measure the effectiveness of on-field evaluation by a physician. The NFHS is interested in scaling and replicating this program broadly, so a thorough evaluation of the program will help the group determine if this technology can improve the way coaches and other athletic officials respond to concussive injuries. Results from the study are expected to be available in 2016. A rare but often fatal condition, second impact syndrome, can occur when an athlete suffers a second concussion before fully healing from a previous concussion. This is why immediate evaluation is so important. If a concussion diagnosis is missed, and the athlete continues to play, a second concussion could prove catastrophic. If the study shows better outcomes for injured student athletes who receive immediate evaluation, the technology may see widespread use in other sports venues. 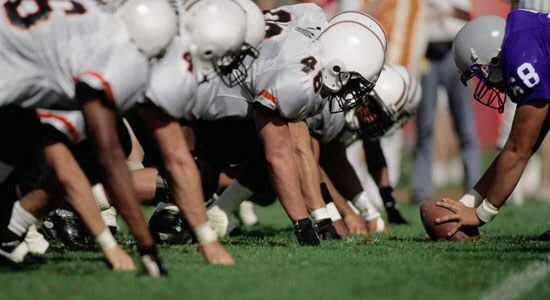 Many schools currently rely on local volunteer physicians for on-the-field care, which is a less-than-ideal situation because volunteers may not always be available when needed, or they might lack the needed expertise in concussion evaluation. This is especially true in small towns with limited medical resources. For volunteer physicians who are willing to be at the game but don’t have expertise in sports-related injuries, the ability to consult, on the spot, with a knowledgeable colleague, would no doubt be welcome. And for coaches who have no physician on the field, a virtual consult via telehealth technology could lead to better decisions about when to let a student play and when to keep the athlete off the field. And while concussions are the number one concern, telehealth consults could be used to evaluate a wide variety of other common injuries, including heat stroke, which has also claimed the lives of young athletes.